I have another post on combining and merging Facebook pages here–with videos–but as you know, Facebook changes things A LOT, so rather than confuse you or waste your time with outdated information, I thought I’d make a new post about this. 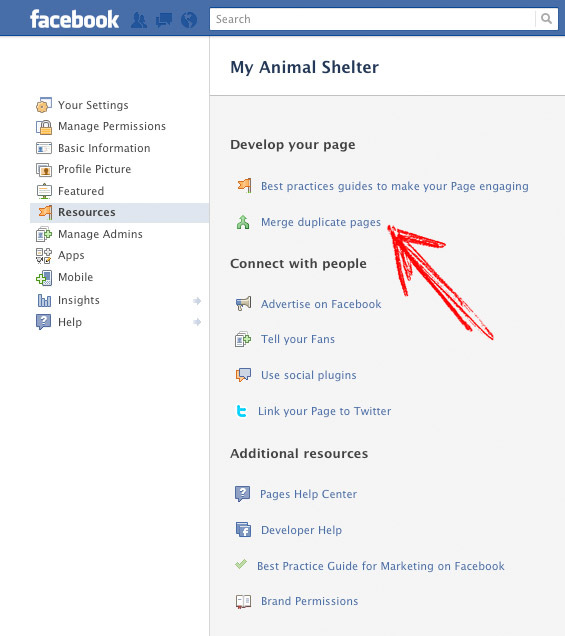 So now, if you have multiple Facebook pages for your organizations–you ca merge the two (or three or four) pages!! Keep in mind, this is for merging two PAGES. If you have a profile/timeline or a group, these instructions aren’t for you. 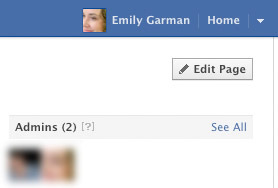 There is currently no way to convert a group into a page, but you CAN now convert your Facebook profile into a page! There are TWO ways to merge your pages. Let’s start with the first and simplest one. If this does NOT work for you, just go to option 2! If your pages meet the right criteria–they were both created by you, they have the same name, and at least one is a “place” page, then you may be able to have Facebook automatically merge your pages for you with one click of a button! To see if you can, go to your page (you must be a page admin to do this) and click on “edit page” in the upper right corner. Then click on “resources” on the left column. If you see “Merge duplicate pages” as an option, then you’re golden! Just follow the instructions there to merge your pages (it will give you a list of pages that are eligible to merge). If you DON’T have this option, or the pages it lists are not the ones you want to merge, don’t worry. There is another way! The first thing you need to do for option 2 is collect the URLs of your Facebook pages that you want to merge together. The FULL URL–that’s the part in the address bar, the facebook.com/ part as well as everything that comes after the /. Next, copy the URLs of the pages you want to merge into the main one. Keep those somewhere, too. Make SURE that you’ve gotten everything off of those pages you want to keep, such as photos, videos, testimonials, posts, etc. The ONLY thing that will be saved from these pages will be your fans–they will merge and combine with the fans of your “keeper” page. Everything else will disappear and you cannot get it back. They have made this MUCH easier, as you know if you watched my old tutorial on this subject! 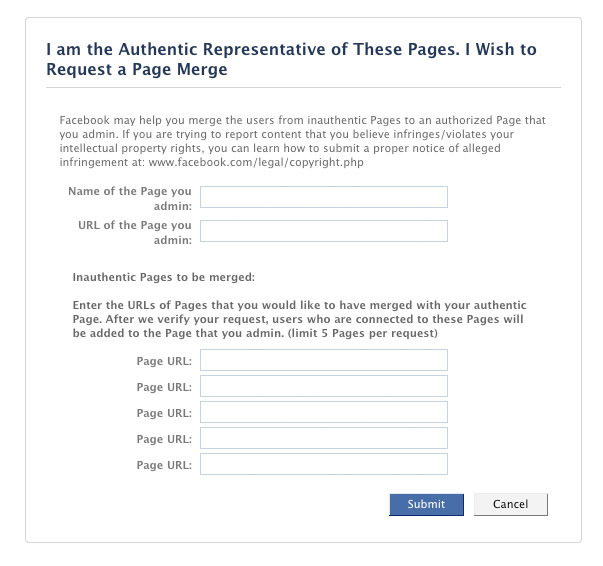 Just go to this URL to submit the request to merge your Facebook pages. Just choose (from the drop down menu) your “keeper” page, and then the others you want to merge into it. They call these “inauthentic” pages, but it doesn’t necessarily mean that. It can mean “extra” pages, or “pages I created by mistake” or “pages that an old volunteer created” or whatever works for you! Keep in mind that if you are merging 3 pages, and each had 500 fans, you won’t necessarily get 1500 fans once it’s all said and done, because some people may have been fans of all 3 pages. But all your fans WILL combine to be fans of your one “keeper” page. ← My Gift to You: End of Year Fundraising Campaign – Use it now! Do you know if it’s possible to have two different urls to link at the same facebookpage? The only way you could do that would be to set up a forward on your domain. so you only get one URL from facebook — facebook.com/yourpage. But if you wanted to buy another domain name, say http://www.yoursite.com, you could set it up to just automatically forward to your facebook page. But no–you can only have one domain in Facebook. It only works in the USA, sorry! Just did option 2 and it worked like a charm! Sent a notice to FB yesterday am and the were merged 13 hours later! PS Thank you so much! I couldn’t find this anywhere on FB Help! Awesome, Kristen! Thanks for letting us know–it helps to see the timeframe that other people experience. or More Facebook pages | The Social Animal™ Blog <Liked it! is this trick works till now? So How do I make it work if I am not in US and need to merge 2 pages? how to merge diffrnt pages? You should find the instructions right here in this post! No, I’m sorry–it only works in the US. Currently there is not a solution that I’m aware of that will allow you to get help outside the US, I’m sorry! I know..Facebook is a blessing and a curse! Glad I was able to help. Facebook is really picky about what it will let you merge. Even if the pages are on the same subject, even if it’s the same football team–they won’t let you. It all has to do with the names being the same. Your page names have to be REALLY similar or they won’t do it. You can try the link in option 2 (if you’re in the USA) and that may work. Good luck! When you say “fans” will be kept, does this include friends that will be kept or will you lose your friends? Pages have fans, and profiles have friends. So if you are merging 2 pages, they both have fans. The fans will be merged together (minus any duplicates). so if one page has 100 fans and the other page has 50 fans, and you merge the pages, you’ll end up with a page that has 150 fans (minus any people who were fans of both pages). If you want to merge a profile with a page, that’s another whole subject–you have to convert your profile to a page first, and then merge the pages. I was the only admin on my page and inadvertantly deleted myself as an admin. After trying everthing, including going through the FB sales department, no help. It was suggested by sales associate that I create a new page and merge them in order to keep my ~8000 fans. But I am unsure if I can merge with my page if I am no longer an admin. Do you know if this is possible? Thank you! You would not be able to merge pages unless you are the owner of both pages (an admin on both pages). So the best thing to do is create a new page, and also try to claim ownership of the other page. This post tells you how to recover or claim a Facebook page that you own, but someone else controls, so it might be helpful to check that out. Good luck! Do you know if the LIKES will transfer over or will I lose those also? Thanks for the post! My concern is whether I’ll lose the data (posts, photos, etc.) of both pages or just the one I’m merging into the bigger page? It only works if you are in the US. Greetings Emily, what if we reach America through Proxy? I’m having trouble finding this “drop down” menu. I click on the link, the page comes up but there is no way of selecting any of my pages. I noticed it may be more convenient to use the other page that is shown at the bottom here, that would have you paste the URLs in, but I don’t believe it exists since nothing loads after clicking on it. I am in the USA. Hi Bryan, I’m not sure why you don’t see the drop down; I can’t really tell without logging into your account. But the page in “option 2” does exist–it is here: https://www.facebook.com/help/contact/?id=238908726149664. Try clicking on that or copying/pasting it into your browser; this will allow you to choose the pages you wish to merge. 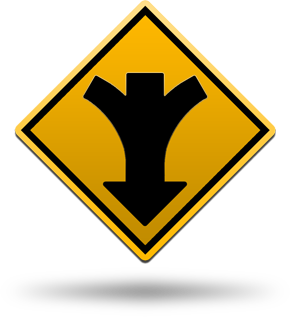 If you still don’t see the options, then it may be the case that your pages are not eligible for merging. Not sure about that–I guess if it thinks that your IP address is in America, then it would work–I’ve never encountered that! – did anyone else try to do it from outside the US and how did he/she do? – did anyone else have to wait longer than 3 days (in or out the US) for the pages to be merged? I just sent the request!! Will let you know if the combine for me! Was easy (almost too easy) Hope it works! Will this work in canada? If not if I give someone in the US administrative privileges and they do it will it work from there? I don’t think it will work outside the US. If you give someone in the US admin privileges, that would probably work!